We are especially concerned by the High Commissioner‘s assertion that there is a stain on the reputation of Sri Lanka‘s armed forces. The aforesaid ‗stain,‘ presumably, is the allegation that the armed forced are collectively responsible (i.e. where the purported acts can be imputed to the command structure of the armed forces and thereby the State itself) for war crimes and other serious crimes purportedly committed during the last phase of the war. 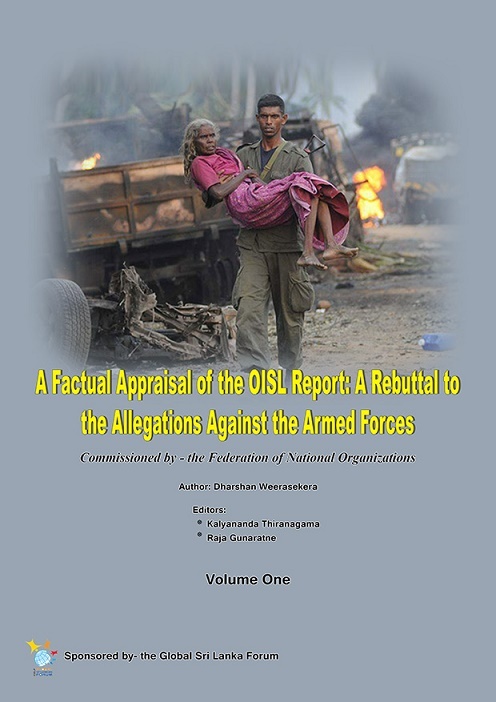 To the best of our knowledge, the only Report especially one with the imprimatur of the UN or any of its subsidiary organs to level the above allegation is the OISL Report (OHCHR investigation on Sri Lanka), released to the public on 16th September 2015. Meanwhile, on 29th September 2015, the GOSL co-sponsored UNHRC resolution A/HRC/30/L.29, which again endorsed without reservation the conclusions and recommendations of the OISL Report. The said resolution was subsequently adopted unanimously by the Council. We, the innocent Sinhala community have been beaten from all around. As long as we are keeping our silence thinking that these invaders will give up one day, we are facing a grave danger of losing our only place to live on earth. They will not stop until they get their pound of flesh, until they get this little Island for their own consumption. The innocent and harmless giant was hurt.. it has awaken and now opened up and decided to tell the truth to the world.. that is why GSLF has published this in cyber space whereas all LieTTE documents and their paid consultant’s reports are not available to public… because they are blatant lies which can be challenged by people..
How long can we tolerate this.. Whatever you did dear patriots,, will go to the history.. you will be considered as saviors of MOTHER LANKA. The Sri Lankan Army could have finished the LTTE off in January 2009 instead of May 19 2009. The reason the Sri Lankan army delayed the victory is because they didn’t want high civilian casualties as LTTE were hiding behind civilians being the cowards they are. Sri Lanka had to fight very carefully and slowly for nearly 4 and a half months to minimise civilian casualties as much as possible. As the Tamil civilians caught in the crossfire were also Sri Lankan citizens. Sri Lankan army wereever possible were helping civilians to safety whilst battling the final stand of what was left of a once feared terrorist group. Well a lot of things have happened in the world since Jan 2015. Thank you, Sri Lanka PATRIOTS ! Long live our PATRIOTS ! PATRIOTISM is the most precious item for Sri Lanka, now and always. Special thanks to Dharshan, GSLF, and Others for this Report and article – truly wonderful work here. In the end, it is a Legal issue with the OISL Report. Sri Lanka response to the OISL Report says ” ….. human rights investigations and NOT criminal investigations, and will ensure … etc” (emphasis mine). Therein lies the whole crux of the matter – HR investigations and NOT criminal investigations. This must be brought out again and again, till Lanka govt & Armed Forces during the conflict are free of false accusations. Human Rights issues are common ground issues to be addressed in Lanka and the whole world. It is Work in Progress for the entire world. ALL in Sri Lankawill have to do what has to be done to address these issues … no small task, but it must be free of false criminal accusations. Much wrong has been done against the People of Sri Lanka due to Colonisation, Cold War/s, and Tamil Caste Wars tying up with Cold Wars. It is high time these wrongs are corrected. This is how I see the main issue of Tamil Separatism which is the main reason for the so called new Constitution. Do correct me if I am wrong here. – That SRI LANKA PORTS (Air & Sea) ARE USED FOR PEACEFUL PURPOSES ONLY and this is added to the existing Constitution as an Amendment. – Remove the ILLEGAL 13-A through an Amendment. No need for a new Constitution. This entry was posted on Friday, March 17th, 2017. You can follow any responses to this entry through the RSS 2.0 feed. You can skip to the end and leave a response.